Abraham Lincoln once said, "Nearly all men can stand adversity, but if you want to test a man's character, give him power." If there's one recurring theme in the news, it's the abuse of power. Leaders and authority figures of every stripe seem to be involved in one scandal or another. Judges, politicians, law enforcers, and school teachers all make the headlines. The acquisition of power precedes corruption, or so it seems for the morally challenged. The development of honor and ethics are at the forefront of martial arts philosophy. At least it's preached that way. But paying lip service to these positive qualities isn't enough; they must be put into action. This is character. It is said that training in the martial arts strengthens one's resolve or purpose. This is what Lincoln meant by "stand(ing) adversity". Can this lead to the development of character? Does enduring the hardships of shugyo (intense training) necessarily make one virtuous? Warriors of every class and culture throughout history have played the roles of both hero and villain. Absolutely and without a doubt, there are saints and sinners amongst us in the modern martial arts as well. Power derived from learning a combative skill can be a blessing or a curse. Wielding this kind of power requires responsibility, wisdom, proper restraint, and character. I don't believe training in the martial ways necessarily gives rise to these traits automatically, but must be acquired through reflective living, learning from mistakes, and resisting the temptation of ego-gratification. Daniel San is a true geisha! Oh, wait, it's in movie number 2. Sorry, couldn't help it. Love those movies. They convey the kind of attitude one should seek out in karate. It's really symbolic too. The black Gi, the black attitude. Funny, I was staining my wooden deck outside and couldn't help but think of miyagi Sensei... up, down, etc. Cheers on another good post. I agree that martial arts doesn't necessarily give you good character. It is solely up to the student and whether it is important to them. I think you get further in martial arts if you develop good character because you enjoy it more. The "power hungry" students never seem to have as much fun. Good post. In my experience the single most important thing in developing a good character is the desire to be a good person. If that's something you care about, think about, and are willing to work for, then time and effort will lead you in that direction. If being of good character isn't something you want, no amount of discipline will lead you in that direction. So very true often when I train I can't help feeling confident but I am always concious of not letting myself fall into arrogance. Geisha? The Karate Kid 2? I must've missed that part! "Power hungry" people are never happy. And for sure, they're not much fun to be around, either! I couldn't agree more. What's important is the intent - the desire to be a certain way, which is independent of anything external. That raises a good point. Yes, there can be a fine line between confidence and arrogance. One antidote for arrogance is to realize there's always someone who's better or knows more. 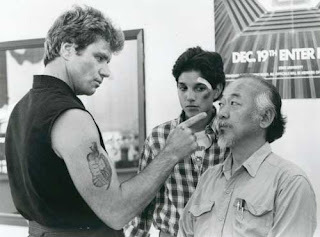 I liked the first Karate Kid movie, but I always thought Daniel was a bit whiny. By the third one, he'd gotten so whiny I was ready to beat the stuffin out of him myself! I do remember the Geisha comment from the second one, though. Oh, I can so relate to this! Our Jr. Black belt doesn't recognize the difference between power and authority. Thursday night when sensei wasn't there and he and I were teaching, it was more work on me to control him than to teach the class. He seemed to have the "I'm a black belt I can do whatever I want" attitude. I actually had to threaten to call sensei just to get him to take his hat off during class. As for me, I don't think I've gotten to the point that I'm battling arrogance yet. I just don't feel that I'm that good, or that I really know enough to be the rank I am. And then, the mean kid (chozen? - Sato's kid) looks at them both and tells Daniel that he dances like a true Geisha. I remember it well, because in the french translation, he says it more like Gay-yi-cha. Which, when you're about 10 years old can be misinterpreted in gay cat. (gay- gay, yi-and, cha-cat) whatever :) It's something you get if you speak french and are about 10 years old. Learning martial arts is like putting a weapon in someones hands. A responsible Sifu must ensure himself that the student has the proper caracter to carry such a weapon. "Does enduring the hardships of shugyo (intense training) necessarily make one virtuous?" "Which, when you're about 10 years old can be misinterpreted in gay cat." Wearing a hat? In a dojo? You've gotta be kidding me! This is what can happen when youngsters are promoted to black belt. Terrible. Nice singing. Don't give up your day job! But to what degree is the instructor responsible? Certainly in the school; but what about the rest of the time? My experience is that the behavior of the students (especially in established schools) is collective, using the teacher as a role model. Well look who's back! Nice to have you around again, Gail. I'll be checking in. "But to what degree is the instructor responsible?" I think that if a students badly hurts someone outside of the dojo using techniques that he learned in martial arts, his Sifu will have to answer some serious questions (at least in Quebec). But I think the biggest problem here is not the students but bad instructors who cannot teach the proper values to his students.